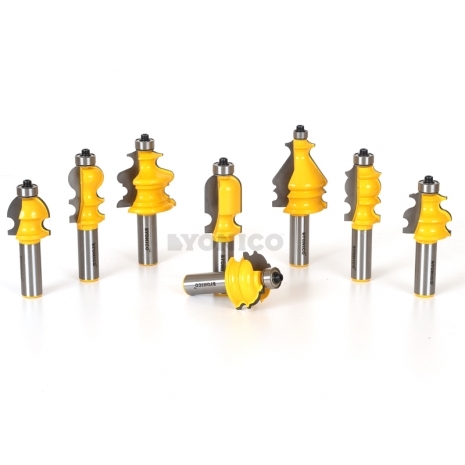 Expand your molding router bit options by including this Yonico 8 piece Deluxe Router Bit Architectural Molding Kit. It is the perfect size kit with a variety of Yonico Molding Router Bits that will allow for an infinite amount of design experiences. This kit’s router bits are ideal for use in architectural mill work. This all inclusive package kit is so valuable boasting huge savings to our customer eliminating the expense of purchasing these high-end molding router bits at individual pricing. Bits are industrial quality, made of premium C3 carbide and double fluted. All router bit shanks are 1/2". Please Note: This kit does not include a display case. The bits arrive packed individually in thick plastic pouches shielding them in shipment and for excellent protection between use.